So begins the tale of a hero told from his own point of view — a story unequaled in fantasy literature. 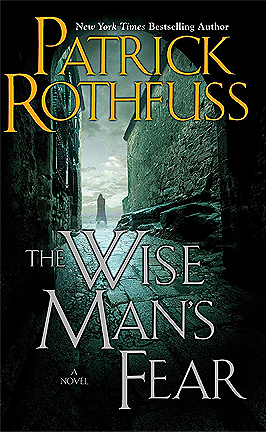 Now in The Wise Man's Fear, an escalating rivalry with a powerful member of the nobility forces Kvothe to leave the University and seek his fortune abroad. Adrift, penniless, and alone, he travels to Vintas, where he quickly becomes entangled in the politics of courtly society. While attempting to curry favor with a powerful noble, Kvothe uncovers an assassination attempt, comes into conflict with a rival arcanist, and leads a group of mercenaries into the wild, in an attempt to solve the mystery of who (or what) is waylaying travelers on the King's Road. All the while, Kvothe searches for answers, attempting to uncover the truth about the mysterious Amyr, the Chandrian, and the death of his parents. Along the way, Kvothe is put on trial by the legendary Adem mercenaries, is forced to reclaim the honor of the Edema Ruh, and travels into the Fae realm. There he meets Felurian, the faerie woman no man can resist, and who no man has ever survived ... until Kvothe. In The Wise Man's Fear, Kvothe takes his first steps on the path of the hero and learns how difficult life can be when a man becomes a legend in his own time. Kvothe talks about the university admissions in the next part of his story. Ambrose gives Kvothe a potion to remove his inhibitions ready for the university interviews. Kvothe borrows money from Devi to pay for his tuition. Kvothe joins Master Elodin’s class on naming, and Elodin gets Kvothe back into the Archives. Kvothe plans to steal a Denna’s ring from Ambrose. He messes this up when Ambrose comes into the room and surprises him. Kvothe thinks he has been attacked magically. He thinks it was Ambrose but his friends convince him that Devi is the culprit. Kvothe goes to see Devi and realises that Devi is innocent. Kvothe goes back to his original suspicions of Ambrose. He thinks Ambrose has his blood. He tries to make a gram to block the magic but is unable to at first. Kvothe and his crew search the Archives and find what they need to complete the gram. Devi helps Kvothe get revenge against Ambrose. Kvothe sets Ambrose’s room on fire, destroying the blood sample. Kvothe is arrested for attacking Ambrose (back in The Name of the Wind). He is cleared of all charges, but Elxa Dal tells him that he should leave the university for a bit. Kvothe is to go to Severen, where Maer Alveron is looking for a talented musician. Maer Alveron wants to woo Lady Meluan Lackless with Kvothe’s help. Kvothe finds out that Maer Alveron is being poisoned by Caudicus. Kvothe runs into Denna again. Kvothe writes letters and songs to Meluan and Meluan falls for Maer Alveron. Maer Alveron asks Kvothe to get rid of some bandits. Kvothe is accompanied by some mercenaries – Dedan, Hespe, Marten, and Tempi. They kill the bandits, but their leader escapes. Kvothe runs into Felurian, who is basically a Fae version of a siren. She seduces Kvothe. It’s a struggle, but he manages to regain control of his mind and convinces Felurian to release him. He promises to return. Felurian gives him a cloak. Kvothe returns to the mercenaries. They run into a bunch of Adem mercenaries, who are angry with Tempi for teaching Kvothe the Ketan and Lethani. Kvothe agrees to travel with this new group. They arrive in Ademre, and Shehyn (the head mercenary guy) agrees that Vashet can teach Kvothe. Kvothe isn’t treated very well during his time in Ademre. Kvothe passes the tests and gets a sword. He leaves for Severen. Kvothe comes across a group of bad guys. Kvothe poisons them and kills them. He then burns the bodies. He interrogates their leader before leaving him to die. Kvothe shares his theory about the Amyr with the Maer, and the Maer agrees that the Amyr are in hiding. Meluan says horrible things about the Ruh, and Kvothe gets defensive. The Maer asks Kvothe to leave Severen but he agrees to pay for Kvothe’s tuition indefinitely. Kvothe finally returns to the University. He had been presumed dead. Kvothe starts earning his own money. Kvothe saves Denna from suffocating. He gives her a ring that she thought she had lost. Denna heads north.